The Dionne Quintuplets as depicted in an ad for "Irridated" Carnation Milk, circa 1935. From top to bottom (in birth order): Yvonne, Annette, Cécile, Émillie, and Marie. The Dionne Quintuplets were the first set of five identical twins to survive infancy. Famous world-wide, the sisters became Wards of the King in 1935, allowing for a systematic release of images and promotional opportunities, which included a trio of fictionalized feature films, starring Danish-born actor Jean Hersholt as their physician. The Dionne Quintuplets ceremony is unique; the Quintuplets' were not permitted to travel at the age of four, and so, their shoes were sent and imprinted by Mr. Hersholt for them in abstensia. Hersholt then placed his handprints, footprints, and signature on the block. However, Sid Grauman did not have his usual cement artist, Jean Klossner, prepare this and Mickey Rooney's block the following week. The blocks deteriorated so badly that they were replaced. The Dionne Quintuplets block was replaced by Dorothy Lamour and Bob Hope's blocks on Friday, February 5, 1943. Grauman's Chinese Theatre, Hollywood, California. Dionne Quintuplet / Jean Hersholt Forecourt block. Executed by unknown. Tuesday, October 11, 1938. Unknown dimensions. Repleced with Dorothy Lamour and Bob Hope blocks on Friday, February 5, 1943. Grauman's Chinese Theatre, Hollywood, California. Dionne Quintuplets / Jean Hersholt Forecourt ceremony, Tuesday, October 11, 1938. Jean Hersholt imprints the shoes of the Dionne Quintuplets in adstensia. 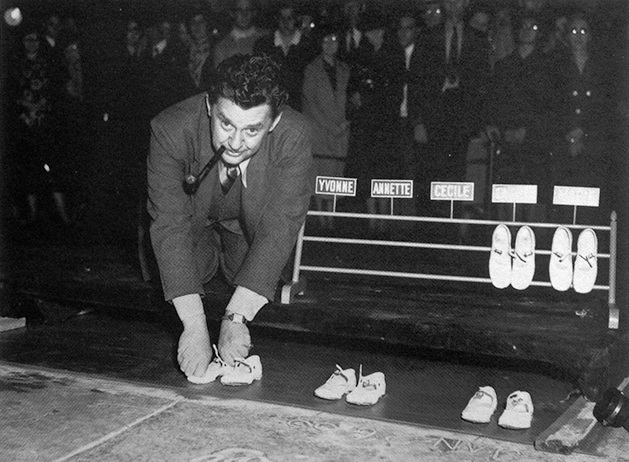 Jean Hersholt was given his own Forecourt ceremony eleven years later, on Thursday, October 20, 1949. 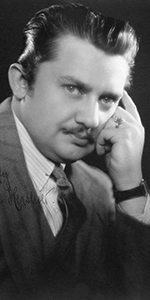 Please read about Mr. Hersholt's career on his own page. The Quintuplets were born to Oliva-Edouard and Elzire Dionne, who had already had five living children. The Quints were born two months prematurely; they were delivered in the middle of the night by Dr. Allan Roy Dafoe and two midwives. Dr. Dafoe did not think the babies would survive. Neighbors kept the Quints alive by placing them in a basket before the kitchen stove, messaging them with olive oil, and feeding them with sweetened water. News of the Quintuplets spread quickly. The Dionne's agreed to show the girls at the Century of Progress Exposition going on in Chicago, but the Canadian goverment stepped in, charging that the Dionne partents were "unfit" and were recklessly exploiting their children. The girls became Wards of the provincial Crown: Dr. Dafoe was made guardian, with the Quints placed in a specially constructed nursery, which contained an outdoor playground from which tourists could view them. Almost three million people saw them in this facility before they were all returned to their parent's custody in 1943. The Dionne Quintuplets were signed up for product endorsements for everything from toothpaste to Carnation evaporated milk (which they reportedly wouldn't drink). Meanwhile, the movie rights had been sold to 20th Century-Fox, who sent a crew up to "Quintland" to film them as the "Wyatt Quintuplets." The resulting films, The Country Doctor (which played the Chinese in March, 1936), and its sequel, Reunion (which played in November, 1936), had Jean Hersholt in the role of Dr. John Luke; the films are really about the Doctor. But the public was so fascinated with the Quints that the films were huge hits. Sid Grauman was a great friend of Jean Hersholts — why not have the Quints do a Forecourt ceremony? At this stage in their Wardship, the Quints were not allowed to travel, so Hersholt imprinted their shoes. Later that year, Fox released their thrid Quintuplet film Five of a Kind (which played the Chinese in November, 1938). The Quints appeared as themselves in the short film Five Times Five (released in July, 1939. The five sisters continued to appear before the public for a number of years. By the time the girls reached adulthood, each one had a different plan for their lives. Émilie died in 1954 by accidental suffocation during an epileptic seizure. She was 20 years old. Marie died of a brain aneurysm in 1970, at the age of 35. Yvonne died of cancer in 2001 at the age of 67. Annette and Cécila are still living. Grauman's Chinese Theatre, Hollywood, California. Dionne Quintuplets / Jean Haersholt Forecourt ceremony, Tuesday, October 11, 1938. 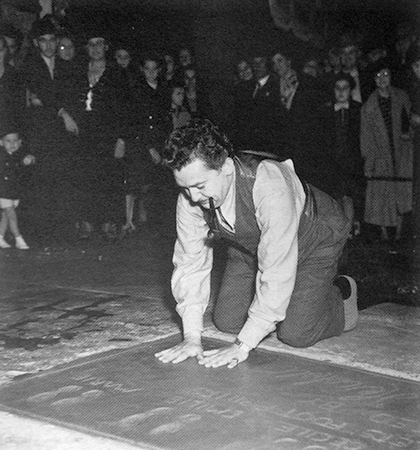 Jean Hersholt places his hands into the cement.